Kagura is a new yakinuku (Japanese-style barbecue) restaurant, located in the vastness of Elements in West Kowloon. Its use of dim lighting and raw, earthly wood and brick decor however, allow it to stand in stark contrast to its clinical surroundings, creating a surprisingly cosy interior. Hong Kong marks the first overseas expansion of this popular Japanese chain owned by Haruyoshi Kashiwaba. In true farm to fork style, the top notch Mirai beef is reared and sourced from his own farms, thus ensuring freshness and quality. Barbecue dining can be fun but it can just as easily be ruined by excessive smoke and spitting fat and oil. Enter Kagura; with smoke extractors within the grills themselves and a stylish bib, they’ve ensured neither affect your dining experience. And so onto the menu. Appetisers range from $60 to $80 and centre around variations on kimchi and salads. We opt for the mix of kimchi – featuring cabbage, cucumber and radish – which is great but, given the small portion size, it qualifies as more of a side than a starter. For mains, there’s everything from rice dishes to steak and bibimbaps. But with your personal griddle taunting us, it has to be a meat platter that we order. These range between $450 and $500 dependent on size and variety. We opt for the assorted supreme yakinuku platter, which comes with six types of meat – four Mirai beef cuts, chicken thighs and pork belly – all fresh and delicious and the perfect amount for a couple to share. For dessert we can’t resist the matcha and yuzu ice creams that come beautifully presented in frozen stone bowls. The yuzu is by far our favourite – tart and with delightful floral notes. 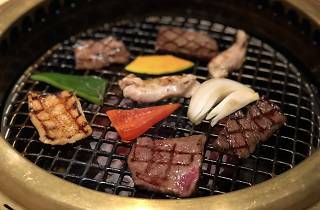 Kagura is a newly opened yakinuku, or Japanese-style Korean barbecue restaurant, located in the vastness of the Elements shopping mall in TST. It’s use of dimmed lighting and raw earthly wood and brick decor however allow it to stand in stark contrast to its clinical surroundings, creating a sizeable yet cosy interior. Hong Kong marks the first overseas expansion of the popular Japanese chain owned by Haruyoshi Kashiwaba. In true farm to fork style, the top notch Mirai beef is reared and sourced from his own farms, thus ensuring freshness and quality. Personally, I've always found do it yourself barbecue dining to be fun but it can be ruined by excessive smoke and spitting oil. Enter Kagura; with smoke extractors within the grills themselves and a stylish bib, they've ensured neither affect your dining experience. And so onto the menu; good design and photography mean the pictured layout is informative yet not tacky and it has a perfect number of options to be diverse without you having to think too hard. There seemed to be a good drinks list but who could pass up the offer of a frozen lager pint with flavours including original, peach and Pina Colada?! Appetisers range from 60 to 80HKD and centre around variations on kimchi and salads. We opted for the mix of kimchi - cabbage, cucumber and radish - which was great but for sure more of a side than a starter! 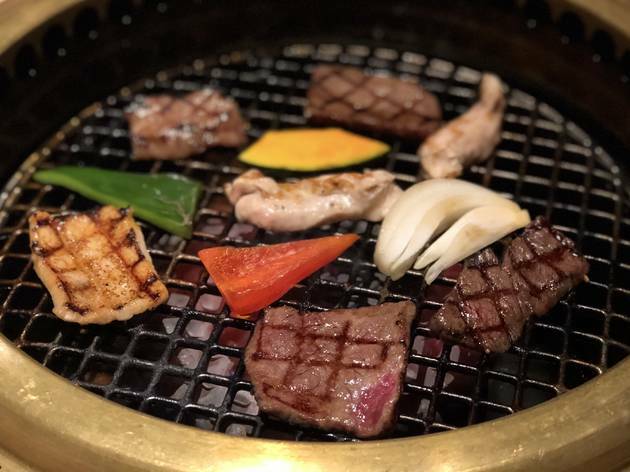 For the main, there is everything from rice dishes to steak and bibimbap, but with your personal griddle taunting you it just had to be a BBQing meat platter for us. These range between 450 and 500HKD dependent on size and variety. We opted for the assorted supreme yakinuku platter which came with six types of meat - four Mirai beef cuts, chicken thighs and pork belly - all fresh and delicious and the perfect amount for 2 people. Finally, for dessert we couldn’t resist the matcha and yuzu ice creams that came beautifully presented in frozen stone bowls; the yuzu was by far our favourite! All in all, we had a great time at Kagura. The only things that let this place down were the friendly but inattentive service and the location. Hong Kong’s ‘problem’ is that it’s absolutely swarming with eateries from corner noodle stands up through to luxury high-end restaurants. You are not only spoilt for choice but also become quite picky in where you are willing to spend your time and money and for me, that isn’t going out of my way to dine in a shopping mall unless I were already there.